After nearly four years of feuding, Lil Wayne has finally been freed from his longtime label Cash Money Records, with The Blast reporting that Universal (which owns Cash Money) has paid out “well over $10 million” to settle a lawsuit that Wayne filed in 2015 against the label and its co-founder Birdman. Lil Wayne initially sued Cash Money for allegedly owing him millions of dollars, with the bulk of the dispute coming from the fact that the label had been refusing to release his then-new album Tha Carter V. Lil Wayne’s argument at the time was essentially that Cash Money wouldn’t release his new album or pay him for recording the album, so he deserved to be let out of the contract. 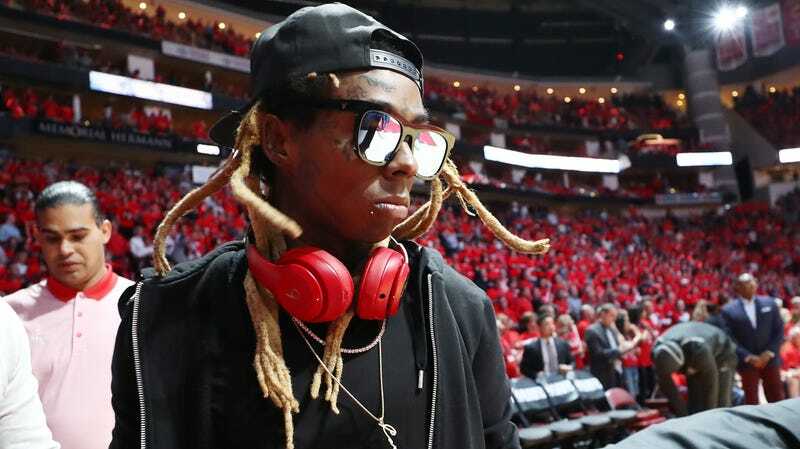 Universal has now made that happen by settling the suit, with The Blast’s sources saying that none of the $10 million actually came from Birdman and that Universal—not Cash Money—is now free to finally release Tha Carter V.
Over the years, this battle between Lil Wayne and Cash Money has seen a lot of weird twists and turns, including a separate lawsuit between Cash Money and Lil Wayne from when he released a free album appropriately called Free Weezy Album on Tidal as a fairly obvious dig at Cash Money. Since he was still under contract, Lil Wayne was barred from selling any new music that wasn’t published on Cash Money, so he tried to get around that by releasing the album for free. There was also a rumor that aspiring supervillain Martin Shkreli had somehow bought a copy of Tha Carter V to sit alongside his one-of-a-kind Wu-Tang Clan album in a collection of things nobody but him could enjoy, but—if he did ever have it—he was ordered to surrender it to the federal government as part of his fraud conviction. That means that not only will us normal people soon be able to listen to Tha Carter V (whenever Universal gets around to releasing it), but doing so will be an indirect shot at Martin Shkreli. This whole settlement is therefore a win for literally everybody except for Martin Shkreli, which is always the best kind of resolution.